The Shut It Down DC Coalition, representing 38 different organizations and local groups in the DC metropolitan area, has released a schedule of events for the upcoming mass days of action from Friday to this Sunday, in opposition to the neo-Nazi and Alt-Right rally, Unite the Right. Day of Free School Classes with the emphasis on Resistance. Join us as we will have multiple teachers facilitate classes such as Self Defense, know your rights, and many more. Please leave phones, bags, etc. in your car. Either don’t bring them, or be willing to leave them in our designated secured area that we will provide for you. Please do not attempt to enter the training without going through our quick security process first. Please come wearing clothes ready for self-defense (comfortable shoes and clothing). Join us, student and community activists, on August 11th to reclaim the North Plaza of the Rotunda and demand justice for those who have suffered at the hands of white supremacy. We are calling on you to rally with us. Bring your friends, your community, your people. ANSWER Coalition is holding a rally at Lafayette Square starting at 1pm. A variety of other groups such as the DSA have signed on in support. 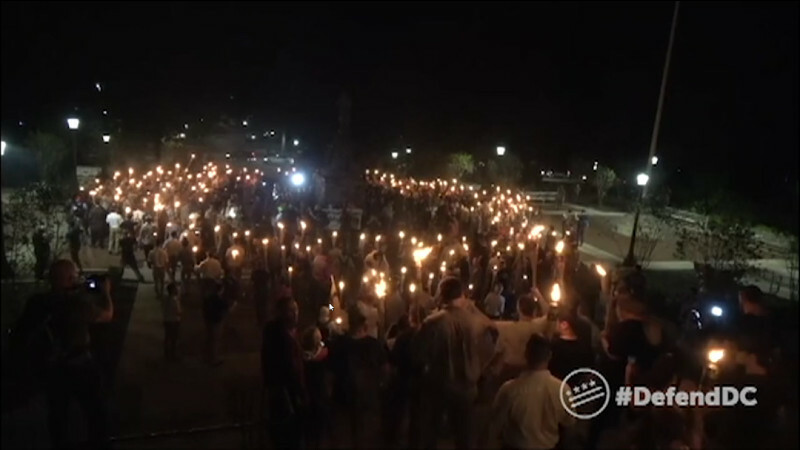 Help stop the white supremacists rallying on the Charlottesville anniversary! We are marching to where the white supremacists will be protesting. There will be a clear division between the end of the rally and the start of the march. You should not come on the march if you do not want to be put in a potentially risky/confrontational situation, as we will be in the same space as the white supremacist rally. Continued rally in Lafayette Square. This is a higher risk space due to proximity with white supremacists, although we do still have a permit for the space.